Slains Castle and its romantic ruins stand alone on the beach of Scotland. Unlike most medieval castles, which at one stage or another in recent history have been restored, Slains remains without state custody. In the course of more than 5 centuries Slains Castle experiences the impact of wind, rain and waves, resulting in its ruins are now unique view of genuine natural charm. Slains is located on the coast of Scotland, looking south, one mile east of the Bay of Cruden Bay in the Scottish county of Aberdeenshire. The ruined palace is completely overlooking the North Sea, is located about 30 km north of Aberdeen. In 2007 appeared a project which provides the ancient ruins of the palace to be converted into attractive tourist apartments (35 in number), but this idea never gets development. Currently the Slains Castle is completely accessible for public visits for free. Preceding the current castle Slains, a structure was located a few miles from New Castle, but it was destroyed by King James VI. The beautiful and magnificent palace was erected in 1597 after its owner Earl of Erroll repairs relations with the monarch. Basis of the New castle Slains is an older house with a tower that has been extended and to which are added new buildings surrounding a courtyard. In 1664 Slains Castle again undergoes major extensions and improvements, then, also appeared the hallway and courtyard. Final design improvements were made in 1836 when they added another wing and built a granite facade of the castle near the beach. Maintenance of this vast and beautiful building, however, requires continuing finances, such as in 1916 the owner had not. Excessive taxes to pay, forcing the Earl of Errol to sell Slains. Unfortunately, the new owner is not making any effort tocare for the palace and in 1925 its roof collapsed. 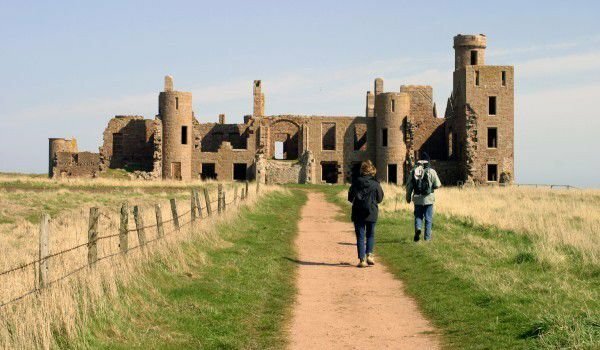 Local residents from the Cruden Bay called Slains Castle often Dracula's Castle. Stories tell how popular writer Bram Stoker was so impressed and inspired by the ruins of Slains that he used them as the basis of his legendary novel about Count Dracula. In fact, Stoker spent in the nearby hotel The Kilmarnock Arms much of his time, which paid for writing the best-seller. Tour the Slains Castle is available at any time of year, there is no part of the palace, which can not be seen. Interesting are the kitchen, billiard room, large hall, corridors, patio rooms and the library. Stables are still visible, as are farm buildings and towers of the external structures. It is recommended that visitors to the castle are wearing boots because you might have to go through mud puddles.